Description:Southampton County’s Premier Medieval Festival! 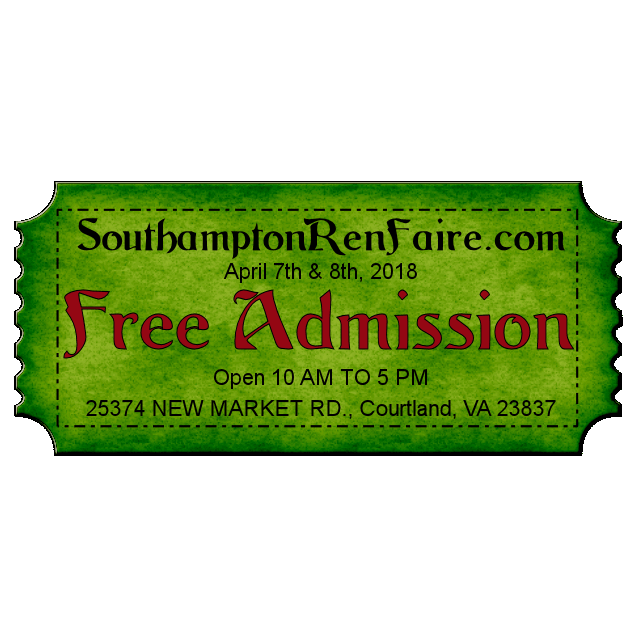 Held annually each spring in the town of Courtland Virginia.Our faire seeks to provide a magical experience that is both fun, as well as educational. See the http://www.SouthamptonRenFaire.com/faire/maps/ for a look at previous faire village maps. Sells Alchohol: No, not permitted on site. Physical Address where packages can be delivered. Please contact secretary@SouthamptonRenFaire.com to coordinate this, as it should be determined at the time of shipment. Other Notes: This is a public area, entrance into the park constitutes your permission to be photographed. People can be photographed if they are in public (without their consent) unless they have secluded themselves (i.e. the privy, etc.) and can expect a reasonable degree of privacy. Free Period or Regular Mundane Camping for The Crew. Want to become part of our crew? . . .